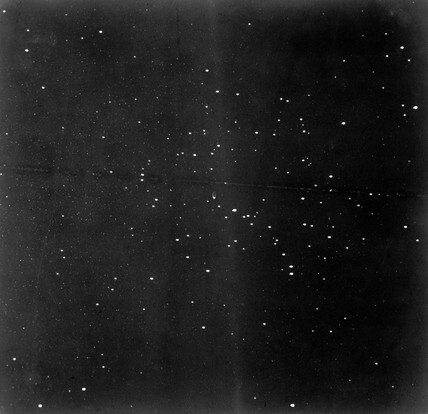 One of a pair of identical photographs of an open star cluster, taken around 1883-1885 by Andrew Ainsle Common (1841-1903), an acclaimed early pioneer of astrophotography. A succesful heating engineer and amateur astronomer, this image was made using Common's 36-inch reflecting telescope at his home in Ealing, West London in England. It is one of the first examples of a high-resolution photograph of a star cluster, showing far more stars than could be recorded using earlier photographic techniques. Open star clusters are collections of hundreds of star that form together in galaxies and slowly disperse over millions of years as they evolve. 'The Great Nebula of Orion', 26 February 1883.